Jonathan Rea is 39 points behind World Superbike Championship leader Alvaro Bautista after the first three rounds. Spaniard Bautista – making his debut in the championship this year – is 39 points clear after romping to his ninth consecutive victory on the Aruba.it Ducati with another treble at Motorland Aragon. Triple race winner Alvaro Bautista (centre) with Jonathan Rea (left) and Chaz Davies. 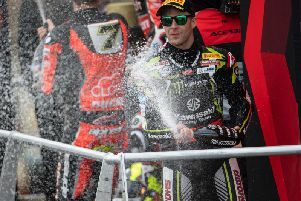 The former MotoGP rider dominated all three races on home soil to win by wide margins and maintain his stranglehold on the series, sustaining an unbroken run of victories since round one at Phillip Island in Australia in February. Rea finished second in each race at the Spanish circuit to make it nine runner-up finishes behind Bautista in 2019, but the Northern Ireland star will need to claw back some ground soon to prevent his rival from building an unassailable lead. Assen hosts round four this weekend in the Netherlands, a circuit where Rea has won eight of the last ten WSBK races, and the 32-year-old will hope to capitalise on his fine record at the iconic Dutch venue to rein in the runaway title leader and keep his hopes of a record fifth world crown alive. Speaking after yesterday’s second race, Rea said on Eurosport: “Second place is very satisfactory right now, I’m very happy, but there’s a lot of hard work to do to win a race and it’s too far to think about, so I’ll keep chipping away and try to bridge that gap a little bit more and find a new feeling. “It’s difficult and although I’m doing my best in second position, I can’t explain how impressive Alvaro is – the job he’s doing is seriously impressive and we have to respect that,” added Rea.